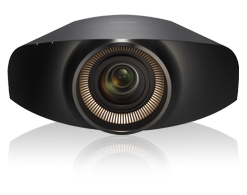 Sony's ES home theater projectors offer an amazing viewing experience. There's a solution for every theater room—highlighted by the ground-breaking Sony 4K projector, which delivers the incredibly immersive clarity of Sony's SXRD™ 4K movie theater technology at home. Sony completes the ES projector lineup with versatile and brilliant options that fit every need and budget. Sony brings years of innovation and industry-leading expertise in professional 4K to home theaters with the Sony VPL-VW1000ES 4K Home Theater ES 3D Projector. The result is the most immersive picture yet, drawing viewers into 2D and 3D movies like never before. Vivid color, film-like image quality and HD brilliance are the result of Sony's three high frame rate SXRD™ micro-display panels. The SXRD chips support full HD 1080p up to 4K resolution for outstanding cinematic quality and incredible image smoothness. 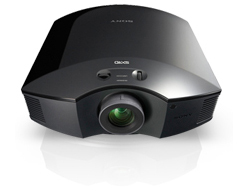 Sony ES projectors provide the most immersive, captivating home theater experience imaginable. Up to 2,000 ANSI lumens provide unparalleled brightness. Ultra-smooth motion from Sony's Motionflow™ 240Hz technology with dark frame insertion. And 24p True Cinema technologies. There's nothing like it. All Sony ES projectors deliver an amazing 3D experience. Virtually eliminate crosstalk with the 240Hz panel drive. Plus, turn any 2D content to 3D with upconversion. Ultra-quiet fans mean you won't even know the projector is on. No worry about distracting fan noise when watching your favorite movies and TV shows. 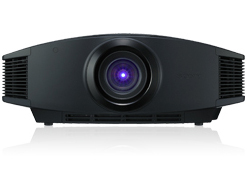 Sony ES projectors easily integrate with virtually all major control systems including features like the AMX device discovery beacon, RS232 and the VPL-VW1000ES also includes Control4® Simple Device Discovery and IP with feedback. Anamorphic lenses are not available from Sony. Requires x.v.Color™ capable video source, such as select Sony camcorders, and HDMI™ cable (sold separately). 35,000:1 contrast ratio achieved with Advanced Iris Auto ON. 60,000:1 contrast ratio achieved with Advanced Iris Auto ON. iPod is a trademark of Apple, Inc. SHOUTcast is a registered trademark Nullsoft Inc. HDMI is a registered trademark of HDMI Licensing LLC.Faroudja DCDi Cinema® is a trademark of Genesis Microchip, Inc. Rhapsody is a trademark of RealNetworks, Inc. All other trademarks are trademarks of their respective owners. Dolby is a registered trademark of Dolby Laboratories. dts is a trademark of Digital Theater Systems, L.P. Gracenote is a trademark of Gracenote, Inc. All other trademarks are trademarks of their respective owners.